There is nothing I like better than digging my toes into cool sand while relaxing to the rhythm of the waves. Clearly, I did not do my research on Angola before I moved here, or I would have known that there are miles of deserted beaches, clean and beautiful, only two hours south of Luanda. Mr. & Mrs. Adventurous (my wonderful neighbors) have done their homework and have explored these beaches along with a myriad of other wonders within a short distance of the city. On our second weekend, they invited us to join them for a day at the beach – which turned out to be like none I had ever experienced before. Imagine driving through continual chaos for over an hour and a half – people lined-up along a road choked with cars and motorcycles, where lanes and traffic rules mean nothing, to peddle their wares. These items can range from brooms to electronics to fish, lobster, fruit…whatever. And an occasional toilet seat to boot! The sellers walk in front of and between the cars, oblivious to the danger of being flattened by a distracted customer, and look for any response from passengers or drivers. I would have loved to take photos of this craziness, but did not dare pull out a camera for fear of having my window smashed and it snatched from my hand. Yes, that happens here. As I said, this goes on for an hour and a half…and then, suddenly you look out the window and see nature. Angola as it was meant to be. 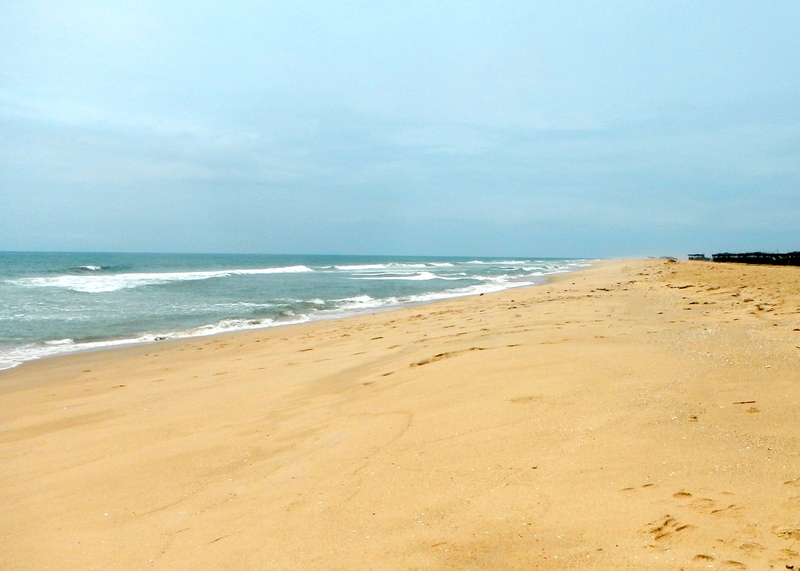 Beautiful, unspoiled beaches – just waiting to be explored. The only other people on this entire stretch of beach were a man with a few fishing poles set up, and a woman digging in the sand for some sort of small mollusks. Later, a group of four or five Portuguese men showed up to frolic in the waves and then an Angolan man came by to ask for money. He was not pushy about it, gave us his spiel and then wandered off. Other than these few visitors, we had the beach entirely to ourselves for hours. We took turns walking the beach to look for shells and just enjoy the solitude and peace of the place. We ate our picnic lunches, drank some local beer called Cuca, and enjoyed visiting with Mr. & Mrs. Adventurous. What a wonderful way to unwind, and so close to the city! On our way back, we drove by several small rural encampments, where children played in the dirt while their parents tilled a garden. Pigs, chickens and dogs were just part of the family and wandered freely. We saw a table laid with baskets for sale right next to the road, but there were no people guarding the wares. Mr. & Mrs. A, who were in the car in front of us, pulled up to the table – I assumed to buy a basket or two. Instead, Mrs. A went to the back of her car and pulled out a bag filled with cookies, chips, juice boxes, etc. No sooner had she retrieved the bag than a tiny, naked boy came running at full speed from somewhere behind some scrubby trees. His eyes and grin were bigger than he was as she handed him the prize. He grabbed the bag, and then ran to show his mother who was approaching from the same direction. She waved her thanks to us and then we were off. Another lesson learned – always carry something with you to give to these precious children. You will absolutely make their day – and your own. Previous PostNow What?Next PostWhat’s in a name? Thanks so much, PK! You would have a fun time seeing in in person, just as I so enjoyed seeing your new hometown!